You have remarkable power right under your nose. The power of the tongue is so great that it’s capable of discouraging or encouraging, hurting or healing, tearing down or building up. Think about it. If you didn’t have a tongue, you couldn’t speak and you’d eliminate most conflict in your relationships. But you do have a tongue. So, what do you do when your spouse or child takes aim at you and starts to fire a verbal assault? Fire right back, right? Well, that’s our instinct, but when we lead with love we receive the “friendly fire,” and don’t pull the verbal trigger, even though everything in us says, “Let it rip!” Sometimes responding with a gentle answer like, “It makes me sad that you feel that way,” or not saying anything at all, is the best response. Here’s why silence is golden when you’re under fire from another person. You never regret what you never say. You give yourself time to think it through so that you can give a calm and reasonable response. You keep things from escalating to an uncontrollable level. There are other times when you are the one that is ready to unleash your tongue’s venom on your spouse or kids. Here are some examples of times when that temptation is at its peak. When you’re tired and irritable after a hard day’s work. When your child is rebelling. When you’re not feeling well. When you’re under extreme financial pressure. It’s during those times that you must remember that your tongue is a wild animal. You need to chain it, tame it, and train it. Chain it by being silent when you know nothing good will come out of your mouth. 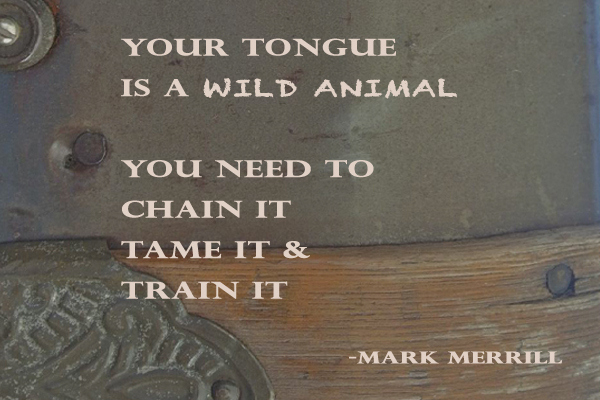 Tame it by vowing each day that you will harness and control your tongue. Train it to breathe life-giving words into those you love. If you do find yourself headed toward a heated argument, take a break and use the REST worksheet to calmly continue the discussion. If you struggle too, I’d love to hear your ideas on how you control your tongue. Please share your thoughts with me below. Portions of this blog came from my book, All Pro Dad: Seven Essentials to Be a Hero to Your Kids.